Now this felt like Championship. A provincial venue with hordes basking in glorious sunshine for a couple of hours before throw-in, the attendance fitting nice and cosy into one of the tidiest of county grounds. Ice creams and sunscreen. Ham and cheese sandwiches wrapped in tin foil and ravenously devoured from a Dunnes plastic bag. The Championship of my childhood. As I apply a bit more rigour to my recollections I recall the occasion the said sandwiches emerged still frozen from the tin foil, the disastrous consequences of an overly-prepared mother who was thinking ahead a few days before the big day but sadly mis-timed the extraction of the said lunch from the freezer. Taking off the rose-tinted glasses completely, and looking back through the record books to those 1980’s pilgrimages to Tullamore (it always seemed to be Tullamore), reality bites. Kildare were shocking in the ’80’s and their performances in Offaly’s county ground reflected that era. Five Championship outings there in that decade and only one win – Larry Tompkins’ two goals “inspiring” an escape against a Longford side whose standing was arguably lower than today. Outside of that Kildare lost to Laois, Meath and Offaly (after a draw) in O’Connor Park and we must have hated the place the way we hate Croke Park today. We’ve loved it ever since though – unbeaten in ten outings in all competitions now since Offaly beat us on the day Wim Kieft broke the nation’s heart in June 1988. And we certainly loved it today as a powerful, skillful, well-drilled Kildare team destroyed an optimistic Meath outfit fresh from shooting the lights out in Parnell Park against Louth. It was hard to avoid the thought this week that this could really be make or break for this generation of Lilywhites toiling in the white jersey. We’d lost six successive Leinster Semi Finals. We’d sleepwalked through a League final against Galway when all the portents looked good for a breakthrough National title. The old doubts resurfacing. If we lost here we were into the “Group of Death” in Section A of the qualifiers, starting out from Round 2, a long way from Croke Park in August. What it would do to the notorious mental fragility of the Kildare footballer was the scarier thought. For sure the display against Laois was encouraging. Brilliant stuff – 13 different scorers, great defensively. But it was Laois… and on the same week end Meath were putting 27 points between the posts against supposedly superior opposition in Division 2-bound Louth. It doesn’t make much to inject a bit of confidence into a Meath team. Call it arrogance if you will. Most would. The implication seemed to be that “break” was the likelier outcome than “make”. His friend Bernard Flynn was already thinking ahead to Meath giving the Dubs a run for their money in the final. So this was arguably Kildare’s most vital game in 6 or 7 years. Kildare didn’t wilt though. Far from it. And it could be the making of this group. In saying that, Meath didn’t exactly “get in their faces” either apart from a ten minute spell after half-time when they popped over four points and wrestled some semblance of midfield dominance from the previously imperious Kevin Feely and Tommy Moolick. The Lilywhites were dominant all over the park with, tellingly, different players having spells of brilliance at opportune times to turn the screw on a Meath team struggling for air. In the first half the midfield duo were majestic, plucking balls from the air like it was going out of fashion (it is and the introduction of the mark really suited this duo). In defence David Hyland had Meath’s talisman Graham Reilly safely tucked in his back pocket throughout “Biggy’s” miserable 56 minutes on the field. Mick O’Grady summoned up the tradition of great Kildare full backs from Paddy O’Donoghue to Davy Dalton and his goal-saving “thou shalt not pass” tackle on Pauric Harnan set the tone for the day. A tap down to himself over the head of Donal Lenihan in the second-half was confidence personified. The half-back line was magnificently marshalled once more by Eoin Doyle while Ollie Lyons continued in his rich vein of form, attacking space with the gusto of a Jack McCaffrey. Lyons’ maturity is also telling – rarely does he waste possession by kicking wildly when the posts are in sight. He recognises his limitations and invariably finds a better placed and better qualified colleague to split the posts. Up front the early power surge was generated by Cathal McNally and the returning Paddy Brophy, catapulted into the starting line-up only six weeks on from his return from Australia by a foot injury to the unfortunate Paul Cribbin. The two inside forwards galloped into space at every opportunity and McNally’s score-taking was above anything we have seen from him previously as he drove Kildare towards a 9 point half-time lead. Brophy was ring-rusty to start with but two inspirational points got the crowd going towards the end of the half and while he faded in the heat in the third quarter before being withdrawn, the option he gives Kildare in attack is a major boost for the campaign. Which brings us to Daniel Flynn. Not since the days when Martin Lynch was doing audacious and unpredictable tricks with the football have we had an attacker with such raw and exciting talent. Ally pace, power, balance and a rare ability to improvise in possession to a refreshing enthusiasm for the game and an ability to trouble the scoreboard with both feet (not to mention hands) and you have one of the outstanding talents of this early championship season. Flynn started relatively slowly while McNally and Brophy, together with the hard-working Fergal Conway, were softening up the Meath defence. It was 10 minutes before he touched the ball but he made that touch count as he ballooned a point to edge Kildare into a 0-3 to 0-2 lead. He added another later in the half but it was in the second-half when the aforementioned trio faded somewhat that Flynn came into his own. In that period, with the game now more even and Meath getting twice to within 5 points, Flynn fashioned two fine points from difficult situations with little room to move to help put paid to the comeback. Of course he was then on hand to flick David Slattery’s pass to the net with three minutes left to round off the win with a personal tally of 1-4. There were moments of pure inspiration once more from the Johnstownbridge man. Against Laois he surprised us with a full somersault with the ball in hand. Here he frequently used a ball-hop to take the ball away from a tackle and into space. On another occasion he cheekily passed the ball to himself over the head of an onrushing Meathman. Coolness and innovation personified. Flynn was almost unmarkable. Slattery overcame a slow start to grow more and more influential in the second-half. You’d love him to finish more of those darting runs through the heart of the defence with a point or two, but you couldn’t argue with his work-rate or his execution in setting up Flynn’s goal. Competition for places is going to get pretty hot up front with Cribbin likely to be back for the final and Neil Flynn returning from the bench yesterday. Not to mention Ben McCormack although he is still some way off a return. Meath started in a Laois-like manner. Brian Menton won the throw-in and James Toher gratefully snapped up the chance his run through the Kildare defence created. We worried but there was no need. Kildare gradually got their systems engaged and McNally found space twice to put Kildare into the lead before Shane McEntee ventured forward to restore parity at two points apiece. The Lilywhites were gradually taking over midfield though. Feely and Moolick between them took 3 marks in the space of 2 minutes at one point and Kildare finished with 7 overall. After Flynn’s first point (set up by a Lyons incursion), Kildare put daylight between the teams. Hyland, not restricting himself to shackling Reilly, punted forward to McNally who won possession brilliantly above Donnacha Tobin’s head and drove straight towards goal. Paddy O’Rourke in goal got a hand to McNally’s low effort but it had enough pace to evade a Meath defender on the line. It was McNally’s third championship goal and sixth in all competitions for Kildare. He’ll win us over yet. That goal prompted Kildare to let loose and they dominated from there to half-time. Unfortunately the wide count ticked along far too rapidly with Brophy, Conway, Flynn and Kelly wasteful. Still Kildare edged the gap wider and by half-time it was up to 9 points (1-10 to 0-4). Feely scored two points from frees but his 30th minute left-footed effort from play was inspirational. Bounced off a defender he swivelled and angled a magnificent long range effort over from the right hand side. McNally had brought his tally to 1-3 by the 17th minute – a remarkable burst from a player not renowned as a scoring machine. Brophy got into the swing of things in the 24th minute when Lyons made another incision and found his clubmate with a good offload. Flynn improvised with that ball-hop technique of his to evade defenders and slot over a right-footed point and Brophy’s injury time effort from the right sent the Kildare support into the break in top form. Other than the wides if there was any criticism of Kildare, they did squander a glorious goal-scoring chance on 34 minutes. The unusually quiet Niall Kelly for once evaded his marker, Mickey Burke, delightfully chipping the ball into his hands while getting back to his feet. But the Athyman blasted wide of the left hand post with Flynn perhaps the better option to tap home to his right. To be fair to Kelly, Flynn was a few yards behind and perhaps out of eyeshot and referee Joe McQuillan did call play back for Burke’s original foul. Meath’s only replies from the 9th minute to half-time were two points from Donal Lenihan. Meath supporters place a lot of store in the expected injection of “old Meath” attitudes that Andy McEntee and his brother Gerry will put into the county team. They had their work cut out at half-time but to be fair to them they seemed to use the interval well. Meath came out and dominated midfield for 10 minutes and swung over four points. It could have been more comfortable though had Feely not spurned the first chance of the period when hitting a long range free wide. It seemed like a better range for Mark Donnellan to have a go. Lenihan shook of O’Grady’s attentions to get Meath off the mark following a Harnan burst and added a free a minute later as the Royal supporters saw a chink of light. 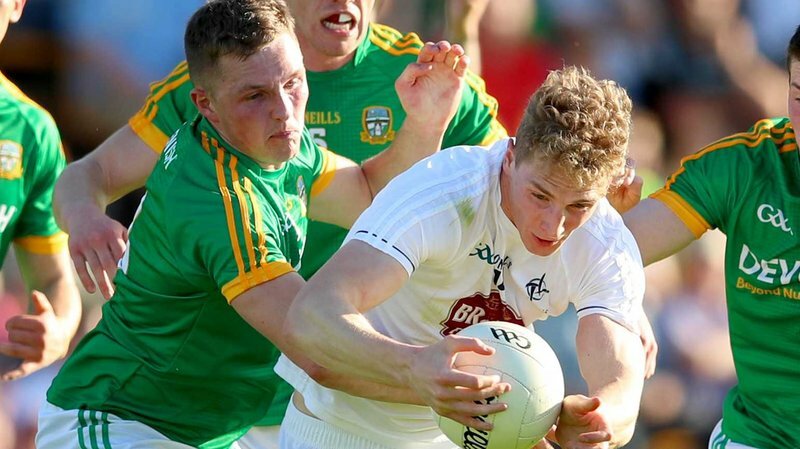 When their excellent substitute Ruiari O Coileain waltzed relatively untroubled through the Kildare half back line to add two more in quick succession it looked like Meath might be in full “Jody Devine” mode. We have to admit to a touch of nerves ourselves. It’s in the genes. But Kildare settled again and while never reaching anything like the fluency achieved in the first half, or the intensity of tackling at the back, they managed to at least hold their own during the crucial next 10 minutes. Slattery was important in that, carrying ball into opposition territory and earning a vital (if soft) free on 42 minutes which Feely this time made no mistake with. A few minutes later Doyle ventured forth down the right and fed Flynn, now playing closer to goal than in the first period. He improvised a point and the gap was back to 7. Meath though were definitely more competitive with Menton at least putting up some resistance. With Moolick and Feely tiring a little in the heat he was relatively unchallenged when firing two points to bring the gap to 5. Ridiculously narrow considering Kildare’s dominance in those opening 50 minutes. It was as close as Meath got though. With Brophy now giving way to hand Eamon Callaghan his 150th league and championship appearance of a career stretching back to 2003, McNally earned a free which Feely again converted. Kildare were somewhat fortunate not to be reduced to 14 men when O’Coileain slipped in front of Keith Cribbin and the older Johnstownbridge brother’s knee found it’s way into the Meath youngster’s back. Was it deliberate or momentum? The officials perhaps were not entirely sure and went with the sensible and diplomatic response of a yellow card. The game became scrappy as benches were used and both teams kicked some bad wides. But Flynn brought some poetry to the proceedings again with another clinical finish from a narrow angle on the right and then Callaghan put two misses behind him to get on the scoreboard. O’Coileain managed a third point for Meath before Kildare put it totally out of their reach with Flynn’s deft finish to the net. Lenihan and the hard-working Burke sandwiched (sorry Mam) points around a free from Neil Flynn to wrap up proceedings with Kildare’s lead back out to 9 points. How to contextualise this performance? Well there have been few better in a match of substance from Kildare since reaching the All Ireland Quarter Final in 2011 and that heart-breaking extra time defeat to Donegal that in hindsight signalled the end of that team. Cork in 2015 is the only one I can think of that came close to this and that has been tainted by the poverty of the Rebels’ ever-worsening performances in the two years since. What impressed here was the authority and cussedness with which Kildare defended, the dominance exerted for long periods at midfield, and the variety of attacking options. The power and pace with which the team played is a credit to Cian O’Neill and the backroom team. Above all the spread of inspirational performances was encouraging. Picking a man-of-the-match is difficult. Sky gave it, understandably to Daniel Flynn. Cases could also be made for Hyland, O’Grady, Doyle (have the first two in particular played a better game for the county? ), Feely and even McNally who sparked Kildare into early life. I’d give it to Flynn by a whisker over Feely. Can we now compete with the Blue Machine is the next question. But that’s one for another day. Just don’t freeze the sandwiches mother! Mark Donnellan 7 – composed at all times, good kick out options taken. Didn’t have a save to make. David Hyland 8 – Graham Reilly had scored 7 points from play in each of his last two games. Enough said. Mick O’Grady 8 – Powerful performance from the Celbridge man. His return such a bonus this year. Ollie Lyons 8 – Playing the football of his life. Whippet like in identifying and utilising space on attacking forays. Jonathan Byrne 7 – Understated by strong defender. Eoin Doyle 8 – Leader. Stepped back and allowed Cillian O’Sullivan to run into roadblocks. Tactic may be a worry against better opposition. Keith Cribbin 7 – Workhorse. More understated than against Laois and lucky enough to escape with a yellow. On another day who knows. Kevin Feely 9 – (0-5, 4f) – There aren’t many finer midfielders currently operating. All round brilliance and the fulcrum of this team. Tommy Moolick 8 – Another powerful display. Some fine marks. Worked himself to a standstill. Fergal Conway 7 – A lot of first half possession but some poor wides. Faded somewhat after the break. Niall Kelly – 6 – played well within himself on this occasion. Has these days a little too often perhaps? May be harsh given overall form. David Slattery – 7 – A promising performance although a slow burner. Great pace, instrumental in the clinching goal. Cathal McNally – 8 – (1-3) -scoring revelation who will give management plenty of selection posers as season goes on. Daniel Flynn – 9 – (1-4) – a unique combination of power, pace and raw enthusiasm. Impossible to mark on this form. A joy to watch.